If you've ever wanted to own a photo sharing social network app like Instagram, then this application is the app template for you! 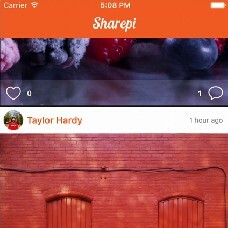 Users can share photos, follow other users and, like and comment on photos. There is a complete documentation showing you how to setup, reskin and upload your app to the app store, check it out here. To watch a video, check it out here. Written entirely in Swift 2. Supports iOS 8 and iOS 9.